Scotland’s original towns - or burghs - date from the reign of King David I (1124-53). Urban living has evolved from the tall and narrow tenemental lands of the burgh high street through the planned Georgian terraced expansions to the Victorian iron-gird tenements and grand suburban villas. 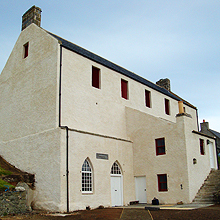 This huge variety of building types reveals Scotland’s unique architectural style, developed over time to create distinctive regional characters according to local variations in geology, climate and landscape. However, this variety in both numbers and architectural diversity can often obscure the significance of urban residential buildings. Whether listed or unlisted, or in a conservation area, LTM apply the same high level of skill and experience to repair projects, from re-pointing the very fine ashlar mortar joints on the buildings facade to reinstating a missing section of ornamental cornicing. LTM’s respected masonry teams, supported by our in-house stone conservators and traditional plasterers can tackle a wide scope of conservation work, ranging from self-funded small scale repointing work and stone repairs to grant-funded reinstatement of ornamental plasterwork. LTM Consultancy can also provide professional, technical advice on building defects and problems, as well as undertaking maintenance inspections and detailed stone and plasterwork condition surveys. We can provide bespoke surveys designed to meet the needs of the building and the client’s budget. "I think the work ethos of Laing Traditional Masonry is perhaps one of the best I have ever come across. I have been extremely impressed by them but most importantly find it amazing that they have maintained their excellent level of service over the years. I most certainly would not hesitate in recommending Laing Traditional Masonry to anyone who was genuinely looking at restoring an old building and cared about doing it sympathetically and in keeping with the history of the building."